Wildfires increasingly impact populated areas across the West (see InciWeb for incident details and a quick map of all current incidents). 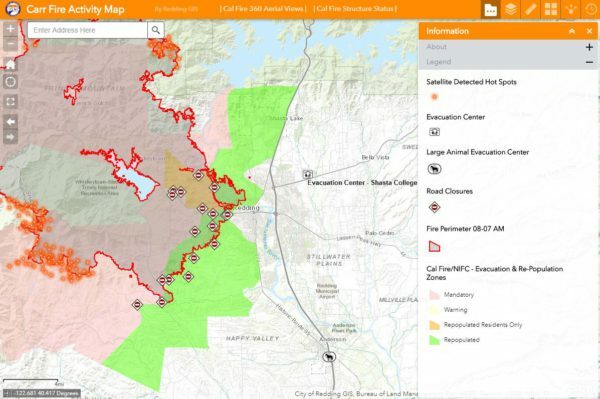 NAPSG Foundation, in conjunction with the Esri Disaster Response Program, has been supporting public safety agencies with best practices for Public Information Maps. This post is a synopsis provided to help agencies get better prepared before the next disaster strikes. The blog is focused on fire incidents, but the same principals apply to most types of disasters. These are the key pieces of information that the public needs for situational awareness during the Response phase – and they want to see this information on a map! One of the biggest challenges facing public safety agencies is their ability to share clear, concise information during early phases of disaster response. They often resort to releasing long lists of evacuation areas using colloquial place names and street names, which can be very confusing for the public. Below are some steps other agencies have taken to mitigate this universal problem. Pre-planning: Pre-plan and design your evacuation areas wherever possible. They should have sensible boundaries that do not cut through properties or isolated roads. 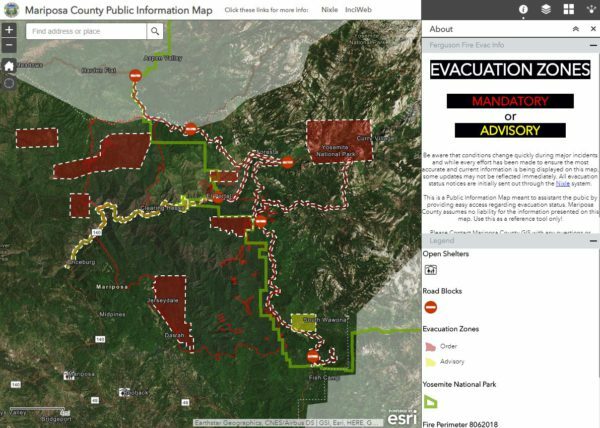 Practice: Use simple tools for changing the status of evacuation areas, and make sure these update in real-time on public facing maps. Practice this process in exercises. Clarity: Keep maps simple and with clear instructions for the public. Use intuitive symbology without too many colors on the map. Let the public know who created the map and how often it will update (see more tips from Google Search Liason for increasing traffic to your maps). Focus on the positive: “Where should people go for safety and resources?” Focusing on the hazard (e.g., wildfire perimeter) can be distracting, and hazard information is often out of date. Performance: Make sure your maps have capacity to scale with a high number of viewers (e.g., host services, web maps, and apps on elastic cloud infrastructure) and that it will work on mobile devices. We especially like maps that are available 24 hours a day/7 days a week and are embedded in agency websites. These maps are ready to go as soon as a forecast is released or soon after a no-notice event occurs, allowing you to get the right information out to the public quickly. This can also help thwart misinformation on social media and provides news media with a consistent source of information that can help amplify your message. City of Redding Public Information Map as of August 7th, 2018 AM. 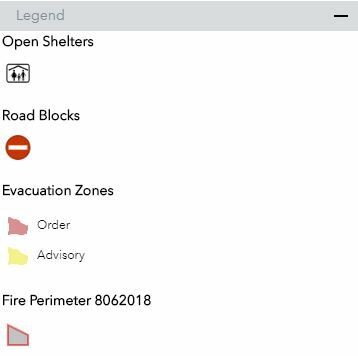 *Update* – The Esri Public Information Solution now features these core information needs (Evacuation Notices, Shelters, Road Closures) and a tool that allows the public to type in their address and find out if they are in or outside an evacuation zone. We know that this can be a challenging process involving more than just technology, and it needs support from the wider public safety team. Please let us know if NAPSG Foundation can help you be more prepared and have important conversations with your public information office and other key emergency management staff (Work With Us). 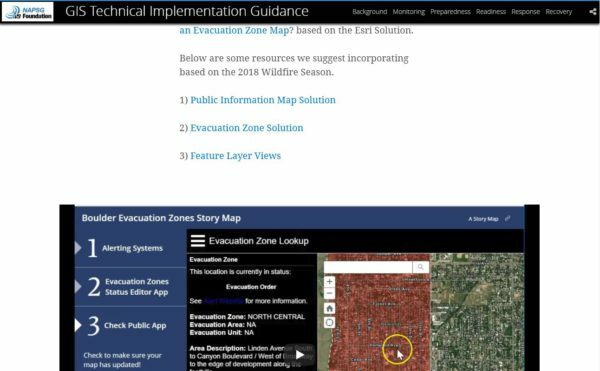 If you are a GIS Specialist looking to support your agency with public information maps, see this GIS Technical Implementation Guide* (especially the Response / Outbound Engagement Section).